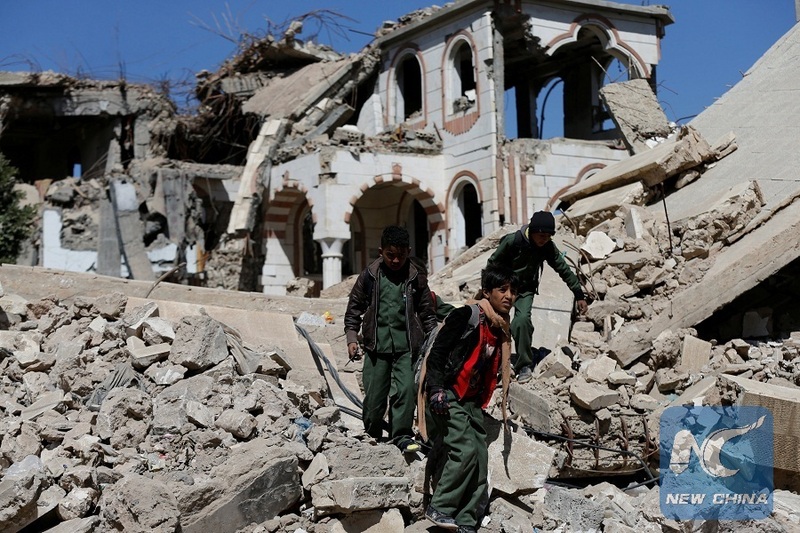 SANAA, Jan. 1 (Xinhua) -- At least 20 civilians were killed on Monday when Saudi-led coalition launched a series of airstrikes on a crowded market and a petrol station in Yemen's Red Sea port city of Hodeidah, a local security official and medics said. The attacks also wounded dozens of others. The market in al-Jarrahi district caught on fire after first airstrike hit the nearby petrol station, while the market was struck two times afterwards, the official told Xinhua by phone, speaking on condition of anonymity. A medic at the Hodeidah hospital said the death toll is likely to increase as many of the injured were in critical conditions. Rescue teams were still searching for possible survivors from under rubble. On Saturday, the coalition fighter jets hit three taxis full of travelers near a crowded restaurant also in the same port city, killing at least 20, according to witnesses and medics.